The world is full of adorable and affordable destinations, and it doesn’t require much effort to find them. 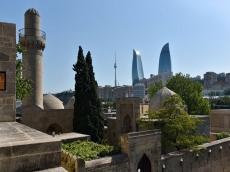 Azerbaijan, also known as "The Land of Fire", offers some of the most beautiful and spectacular sights and places to visit. In her article "Azerbaijan will surprise tourists with its diversity", reporter of Russian Metro edition Anna Khramtsova discovers fantastic things to do, places to go and more in two beautiful cities of Azerbaijan- Baku and Gabala. Just browse through these awesome pictures and be amazed by their beauty.